June 5, 2011 - The Global Business Travel Association (GBTA) announced that U.S. Transportation Security Administration (TSA) Administrator John S. Pistole and United Continental Holdings, Inc. President and Chief Executive Officer Jeffrey Smisek will join GBTA Executive Director and Chief Operating Officer Michael W. McCormick for the opening session at the annual GBTA Convention 2011 in Denver, Colorado, August 21-24. The session, “LIVE with GBTA—The World’s Largest Airline and What’s Next in Travel Security” will be held Sunday night at 5:00pm MST on August 21, 2011 in the Wells Fargo Theater. “LIVE with GBTA—The World’s Largest Airline and What’s Next in Travel Security”. 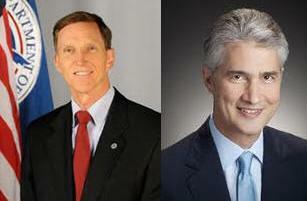 John Pistole was sworn in Administrator of TSA in July 2010. He oversees management of a 60,000-strong workforce, the security operations of more than 450 federalized airports throughout the U.S., the Federal Air Marshal Service, and the security for highways, railroads, ports, mass transit systems and pipelines. Prior to beginning his career at TSA, Pistole was a 26-year veteran of the Federal Bureau of Investigation (FBI) with extensive national security and counterterrorism experience. He was put in charge of the FBI’s expanded counterterrorism program, eventually becoming the FBI’s Executive Assistant Director for Counterterrorism and Counterintelligence. In 2004, Pistole was named Deputy Director for the FBI. Jeffrey Smisek, president and chief executive officer of United Continental Holdings, Inc., began his prestigious career at Continental Airlines, Inc. where he was the chairman, president and chief executive officer. During Smisek’s 15 years with Continental, the carrier significantly expanded its global presence, and served more international destinations than any other U.S. carrier. In 2009, FORTUNE magazine rated Continental the number one airline on their annual airline industry list of “Most Admired Global Companies” for the sixth consecutive year. The GBTA Convention, with more than 6,000 attendees, is the largest, most comprehensive annual gathering of business travel and meetings managers, meeting planners, procurement professionals and suppliers anywhere in the world. The Business Travel Event of the YearSM features: more than 70 industry-leading education sessions organized into 20+ specialized tracks geared to specific levels of experience and a variety of disciplines; an 400+ company Exposition showcasing market choices not available at other industry gatherings; sessions featuring world-renowned speakers and industry leaders; a wide selection of professional development opportunities; and, much more. The Global Business Travel Association (GBTA) is the world’s premier business travel and meetings organization. Collectively, GBTA’s 5,000-plus members manage over $340 billion of global business travel and meetings expenditures annually. GBTA provides its network of 17,000 business and government travel and meetings managers, as well as travel service providers, with networking events, news, education & professional development, research, and advocacy.